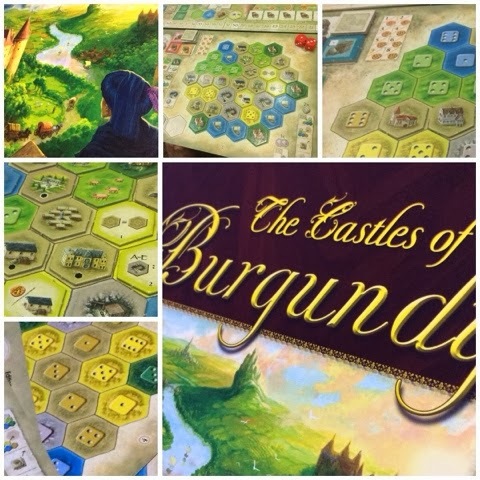 If you have been listening to our podcasts ( which you better, *sharpens knife* ), you will know that I love Castles of Burgundy ( Castles ). It's probably my favorite game of all time and something I would never ever refuse a game of. Will just go through the basic mechanics and why its such an awesome game in my opinion. 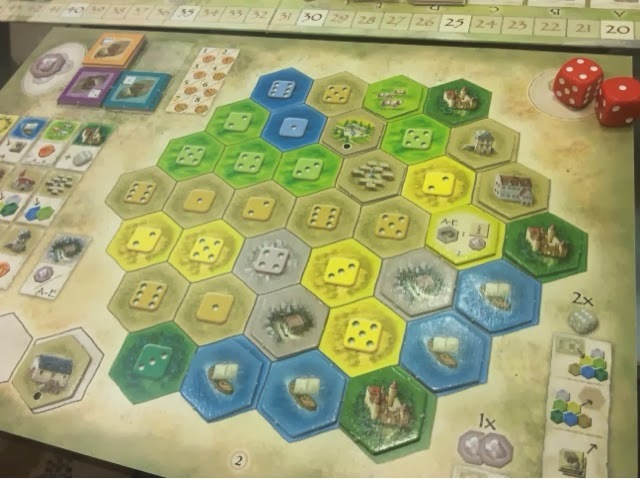 Castles is a tile placement, set collection game where players roll dice that determine the choices they have for the actions that they may want to undertake. The game is played over 5 rounds of 5 turns each, so a total of 25 turns will be taken throughout the course of the game. The player with the most points at the end of the game is the winner. During each turn, each player will roll 2 dice and depending on what number shows up on each die, the player can then decide to execute 1 of 4 actions per die they have ( so 2 actions per turn ). **A fifth action - buying a tile from a reserve area - is available to any player who has 2 silverlings ( money ) in their possession. No die is required to undertake this action. The game when explained as such makes it sound simplistic in nature, and Castles indeed is a simple game to teach, but, its the abilities & effects of each tile and its synergy with other tiles that makes the game very interesting and adds depth & replayability to the game. 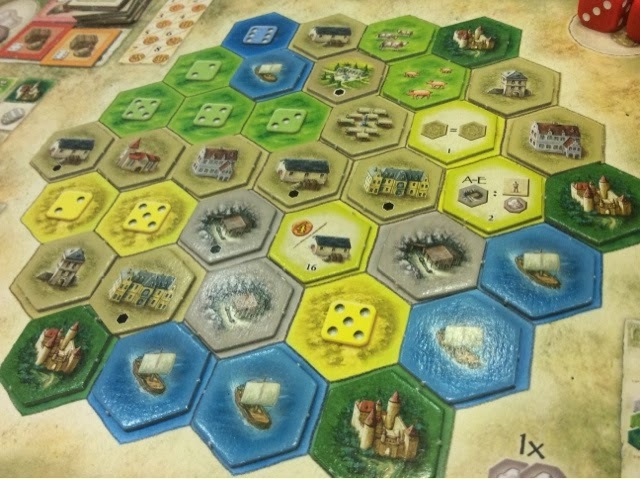 There are 6 different types of tiles in Castles that each offer a unique ability when placed on a player's board. The first are the Castle tiles. These tiles allow the player to immediately take an additional action as if he/she has a die of any value of their choosing. The Castle tiles are similar throughout the game. The second are the Animal tiles. These tiles score points based on the number of animals showing on the tile. The tiles come in 4 different animal types ( cow, sheep, pig, chicken ) and benefit the player the most when he/she collects the same type of animals. If you place a new tile with an animal type that you already own, you may score all tiles of the same animal one more time. The third are the Mine tiles. Mines come in one type and benefits the player by awarding him/her one silverling at the end of each of the 5 rounds. Silverlings enable players to buy tiles from a reserve area on their turn. The fourth are the Building tiles. These tiles are possibly the most interesting of the lot. There are 8 buildings in the game which offer a multitude of benefits. One allows a player to take a particular type of tile from the board immediately, another allows the player to place any tile from their storage onto their player board, another also gives you a free action to ship goods. When timed well, the buildings can help you to execute big turns which can really blow your mind. The fifth are the Ship tiles. These affect the turn order of the game and allow you to collect goods to ship on future turns. The last are the Knowledge tiles. These tiles either provide the player with an ongoing in-game ability, or they offer the player end game scoring bonuses. Some of the abilities include collecting a silverling and a modifier from each mine you have, or to receive 4 modifiers instead of 2 when you use a die action. End game bonuses cover everything from the types of animals you have, to the goods you ship, or to the buildings you have built. So how do the die values factor into all of this ? Well, the main board is divided into 7 areas. 1 per die value and 1 reserve area. So to take tiles from each area, you have to meet either the die value criteria, or you have to have 2 silverlings. Your player board also has die values printed on each tile space. To place a tile in a space, you have to satisfy the die value and the tile type criteria. Even when you ship goods, the die value must match as there are 6 types of goods that correspond to the values of the die. So if ever you need a value that you didn't manage to roll, you better hope you collected enough modifiers to make the necessary adjustments ! The last aspect of the game that takes the game to even greater heights is the race to finish areas on your player board. 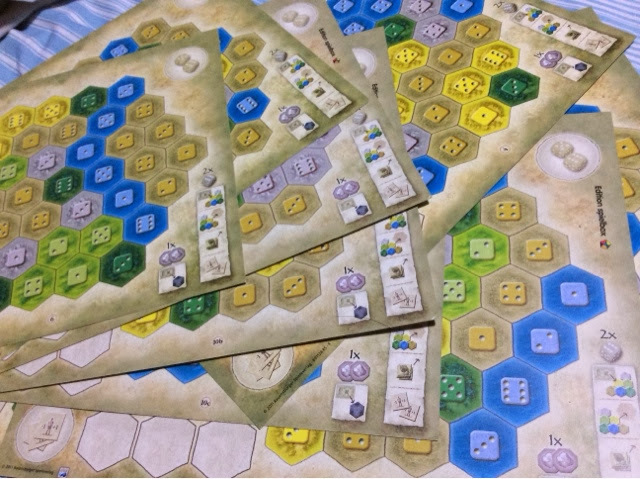 Each player board has small areas of each tile type. Each time a player completely covers the area of one tile type, the player scores points depending on the size of the area and on which round he/she managed to accomplish that task. So the players are mostly racing to cover the smaller areas first to capitalize on the early round bonus points. But there's also a first and second bonus for the players who are able to cover all of one type of tile area on their player board. Each tile area of the same type are usually spread around the player's board; so you are trying to disperse and cover those areas as fast as possible to claim the additional benefit of that type. It may sound insignificant in the flurry of points you can receive, but in the last two games which I had lost ( one by 1 point, the other by 2 points ), it was my forgoing of claiming the mine bonus and pursuing other interests that cost me the game. Well, in the last game I suffered from over-blocking as well. Bleh. Well, that's how you play Castles ! I hope with the help of the pictures you will be able to have a clear enough idea on how the game plays. So, what do I love about Castles ? The race for the tile type and area completion bonuses is very fun. Everyone is building towards those goals and while you may not be able to stop them ( at least not all the time ), you can maneuver yourself into a position of grabbing things first and thus thwarting their plans till a later round as each tile on offer is limited per round. The combos that you can pull off with each tile is also very rewarding. It may seem like the combos come naturally, but that is not the case. You must plan and have a keen eye to see the best turn you can make with the abilities offered to you by your selected tiles. You can't just play and hope that the combos power you to victory. Proper planning is required and the timing of the tile placement is also extremely crucial. I love that the dice can really mess with your game plan or at least force you to a different direction that you had hope to go. It may sound frustrating or that a lot of luck is involved but its very manageable with the modifiers and its something that can be planned and accounted for in advance. The set collection portion of the game is also very intriguing. The animals make you want to collect them in similar sets whereas the buildings can only be collected in different sets. But the building abilities are so useful that you really want to collect them in similar sets so that you can get the ability and also score them with the proper knowledge tile at game end. 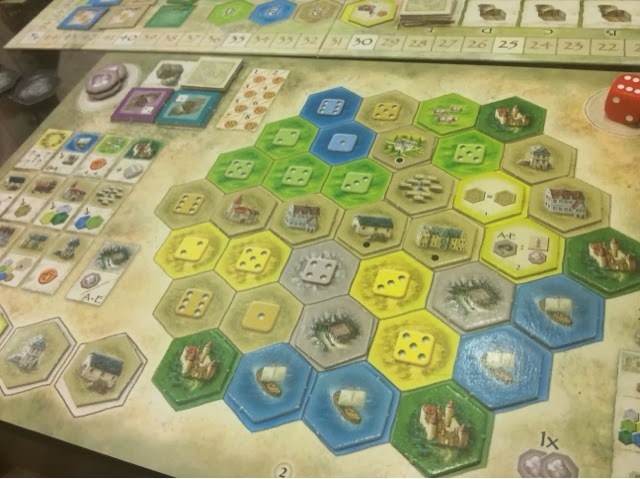 So to make that happen you may choose to expand your tableau in a way that you can start placing buildings of the same type on your board ( as long as they are placed in different sections of the board ); all that while trying to fight for the hotly contested ( and extremely limited ) mines and castles. Castles also packs a lot of replayability instead the box. You get a slew of different player boards that change how you play the game and on what tiles you might want to put focus on. Paired with the dice rolls and the random assortment of tiles each round, its very likely that no game of Castles will play the same way. Castles also has some expansion player boards that are already out and a mini expansion with new tiles that bring some unique abilities to the game. If there's anything that I dislike in Castles, that would be that the game color hues are very similar and can be tough to differentiate under poor lighting conditions. Also, the game is pretty fiddly to setup with all the color tiles to be sorted and placed on the board at the start of each round. This also means that packing up is just as tiresome. The component quality is also very poor. The tiles are pretty thin and look like they could bend if handled improperly. Aside from these component issues, I really have no problems with the gameplay. It plays smooth, its engaging, and most important, its extremely fun. Its one game that will always stay in my collection and something that I will play on any given day ( or night ). If you haven't played Castles before, I strongly suggest you go check it out ! I much prefer written reviews to video reviews. Thanks for sharing this! But, at push your luck podcast you can get both !